MISSISSAUGA, ON -- (Marketwired) -- 12/27/13 -- The United States may be known for baseball and apple pie, but hockey belongs to Canada -- as does the 42nd Annual International Silver Stick® Brampton Regional Hockey Tournament. For this year's event, the Fairfield Inn & Suites Toronto Mississauga is happy to host players, coaches, families and friends with convenient, affordable accommodations just 4.6 km away. 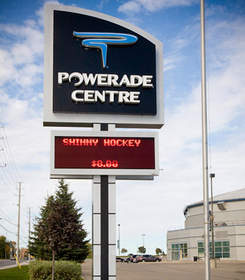 Held in Brampton, Ontario at the Earnscliffe Recreation Centre and Powerade Centre, the Brampton Regional Silver Stick® is one of the largest and longest running Silver Stick® Regional Qualifying Tournaments with participation of 154 teams. The tournament, held on December 27th-30th, has been organized under the guidance of the Brampton Youth Hockey Association since 1998, and features teams in the major age divisions from Novice to Midget that are in the AA and A classifications. Among hotels near Brampton, the Fairfield Inn & Suites is an all-star. For young hockey players as well as business and leisure travelers, the brand new Fairfield Inn & Suites is a unique Mississauga, Canada, hotel. Guests can walk to 18 different restaurants and Cineplex Odeon Courtneypark Cinemas. The Fairfield Inn & Suites Toronto Mississauga is also conveniently located near major corporations, such as CML, DHL, Citigroup, Oracle and World Vision, and offers complimentary shuttle service to and from local offices and easy access to the 400-series highways. Guests also have a choice of 51 Mississauga hotel rooms and 28 suites on five floors. Featuring a complimentary breakfast, brand new accommodations with mini-fridges and 37-inch HD TVs, a heated saltwater pool and fitness center, this Fairfield Inn Toronto hotel offers a relaxing start or finish to a long day of hockey. Guests will also revel in the property's complimentary high-speed wireless Internet and convenient Mississauga meeting space. With their downtime, guests can easily access Toronto Pearson International Airport, Mississauga Convention Centre and Square One Shopping Centre, one of the largest malls in Canada and the brand new Toronto Premium Outlets! With all these conveniences, the Fairfield Inn & Suites Toronto Mississauga is the ideal choice when choosing Mississauga hotels. To explore hotel deals in Mississauga at the Fairfield Inn & Suites, and check availability, guests are invited to visit http://www.marriott.com/hotels/hotel-deals/yyztm-fairfield-inn-and-suites-toronto-mississauga/. Brand-new and business savvy, the Fairfield Inn & Suites Toronto Mississauga offers comfort and convenience for every type of traveler. With a location near major corporations including Citigroup, DHL, CML, World Visions and government departments, the Fairfield Inn & Suites Toronto Mississauga is a smart choice for visiting colleagues or clients. Its 325-square-foot meeting room can host intimate meetings of 18, while the nearby Mississauga Convention Centre is home to conferences, exhibitions and more. Accommodations feature a fresh design and color palette, work desk, complimentary Wi-Fi, remote printing capabilities, minifridge, 37-inch HDTV, coffeemaker and free local calls. Suites serve as convenient Mississauga wedding accommodations, featuring spacious living areas. Those with their own cars can park for free and then head out to explore nearby Square One Shopping Center, dining and entertainment. Mornings are always good with complimentary breakfast, a workout in the fitness center or a dip in the heated saltwater pool.